It is with great sadness that those in the extended Frye community learned of the death of Ron Schoeffel on July 4. 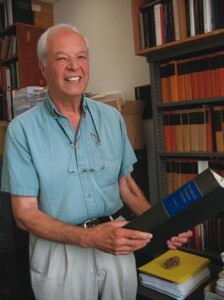 Ron, a long-time member of the staff of the University of Toronto Press, was the editor of the Collected Works of Northrop Frye. It was under his steady hand that the 30-volume Collected Works of Northrop Frye were published, beginning in 1996, at the rate of two per year. Ron also initiated the great Erasmus project at the U of T Press, an account of which can be read in Robert Fulford’s column here, and he was also the editor of the U of T Press’s Bernard Lonergan series. My first contact with Ron was in the mid-1980s while working on the Frye bibliography. Then in the 1990s and following there were countless communications back and forth as the various volumes of the Frye Collected Works made their way into print. It was to Ron that I turned over the typescript of the Frye-Kemp correspondence in 1994 as we sat in President Eva Kushner’s office, when the vision of a collected works was beginning to take shape. Ron was always the consummate professional, while at the same time being a warm, caring, fun-loving human being. The last words I heard Ron say were at the Frye conference at Victoria College last fall, when he reported that his wife was the only person he knew who had ever been trapped in an elevator with Northrop Frye. Perhaps someone knows about a second chapter to the elevator story. We will all miss Ron greatly. Ron’s obituary can be found at here. This entry was posted in Uncategorized on July 11, 2013 by Bob Denham.